Responsible news organizations publicly acknowledge errors when they discover them. Sometimes it takes a while to check the facts and set the record straight. Every year on February 25, I and my former colleagues at the Voice of America commemorate our first broadcast. VOA went on the air during the initial bleak months of 1942 following the entry of the United States into the Second World War, when we and our allies were taking a beating on every battlefront. We use the anniversary to remind ourselves, and assure our international audience, that we are still guided by the introduction to that long-ago program, which was relayed by shortwave radio across the Atlantic Ocean and transmitted to Nazi Germany by the British Broadcasting Corporation: The news may be good or bad; we shall tell you the truth. Some years, especially anniversaries with round numbers, VOA stages elaborate formal ceremonies. Other anniversaries are more modestly marked with a press release, a memo to the staff, and perhaps a small reception. On February 25, 1957, we rated a presidential visit. 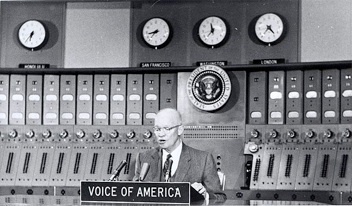 The wartime general and postwar president, Dwight Eisenhower, began a formal speech on foreign policy that day from our Master Control room by saying: “For fifteen years now the Voice of America has been bringing to people everywhere the facts about world events, and about America’s policy in relation to these events.” VOA broadcast the speech worldwide. Only problem is, we’ve been celebrating the wrong date. 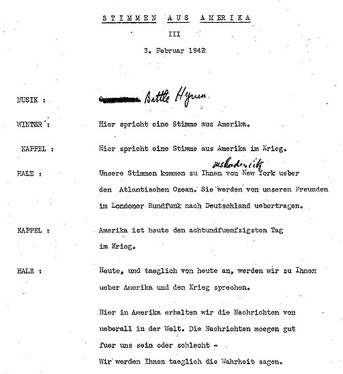 However it happened, apparently nobody at VOA noticed when the American actor and film producer John Houseman, the first Voice of America director, recalled in his 1979 autobiography that the initial program had been broadcast on February 11, and even published a photograph of the dated script to prove it. It should have been obvious to anyone reading Houseman’s book that the February 25th anniversary we had been celebrating was incorrect. Well, actually it turns out Houseman had the date wrong, too. I first learned there was a question about the anniversary from my old friend and former boss, Alan Heil, author of Voice of America: A History. Alan sent me a copy of a reminiscence by the diplomat and author Walter R. Roberts, apparently the last survivor of the Voice of America’s original staff, who noted the discrepancy between the date of the first broadcast celebrated by VOA and the one reported in Houseman’s autobiography—and disputed both of them. His recollection was that it was earlier than either of those dates and he concluded that it probably took place on February 1, 1942. In the summer of 2010, shortly after I retired from “the Voice,” Alan introduced me to Walter over lunch. Alan and Walter, at 94 still articulate, animated and very much in command of his detailed memories of that time almost seventy years earlier when the United States began broadcasting to the world, persuaded me to have a go at finding definitive evidence of when the Voice of America first went on the air. And so I signed up for a researcher’s credential at the U.S. National Archives and began working my way through the records of the government’s World War II information program. The search was complicated by VOA’s baroque organizational history. The first Voice of America program was broadcast under the aegis of the Coordinator of Information, a department that included both the collection of information—i.e., intelligence—and the transmission of propaganda (yes, that’s what they unabashedly called it) to both American and foreign populations. Each of the departments and agencies that were successors to the Coordinator of Information wound up acquiring some of its wartime files and each of them, during the intervening years, dutifully transferred them to the National Archives, which makes official records of the government available to historians, other researchers and the general public. But because the documents arrived at the Archives from so many different sources, it was probably inevitable that they would be catalogued inconsistently. And since one of the tenets of the archival process is that records must be preserved precisely as they are received, the surviving documents are organized according to the idiosyncratic filing systems of each transmitting agency—in most instances, inside the original file folders that were delivered to the Archives. During August and early September, 2010, I made several visits to the Archives’ cavernous facility in College Park, Maryland, to search for the 68-year-old files of the Coordinator of Information. I also queried the Franklin D. Roosevelt presidential library in Hyde Park, New York, in the hope that the coordinator, the colorful New York lawyer William J. (“Wild Bill”) Donovan, or one of his principal subordinates, had sent President Roosevelt a memorandum announcing that the radio broadcasts to Germany had begun. (No such luck.) I looked at hundreds of documents dating from the middle of 1941 to the end of the war in 1945, but only a few were from that critical period in January and February, 1942, when the Voice of America first went on the air. Most of the latter referred to information programs other than international radio and the few that did mention broadcasts to Germany provided no clear evidence of their starting date. Finally, after a series of dead ends, I stumbled on a catalog entry that referred to “scripts of news broadcasts to various countries overseas . . . [summarizing] events of World War II for radio listeners” that had been transferred to the Archives by the U.S. State Department after the war. Unfortunately, the records were nearly lost in archival limbo. No physical location for them within the vast College Park complex had been recorded in the standard “finding aid,” rendering them effectively inaccessible. A young Archives technician performed some complex detective work involving a location index that had long since been retired (apparently the National Archives maintains archives of its obsolete archival indexes! ), and triumphantly produced an entry for the Domestic Branch of the Office of War Information—the outfit that produced morale-building propaganda for the American public. I explained that the Domestic Branch couldn’t have created the materials I was looking for, but she persuaded me to have the records “pulled” anyway, and a couple of hours later I found myself thumbing through boxes of radio scripts in several languages from the first months of 1942: somewhat faded, awkwardly folded, occasionally torn, but still quite legible documents, the oldest of the surviving copies printed on fragile onionskin translucent paper. The earliest script preserved in the file was the one for Tuesday, February 3, 1942,2 but it is clear that wasn’t the first Voice of America program because at one point the script calls on one of the announcers to refer to something he said “yesterday.” The reference to the previous day’s program obviously means there had been a broadcast on Monday, February 2. But was that the first? Walter Roberts and I had independently noticed that the illustration of the February 11 script in the Houseman book had a Roman numeral XI typed under the title, and guessed that it might mean it was the eleventh in the series. Sure enough, at the top of the February 3 script, just under the title Stimmen Aus Amerika and the date, was a Roman numeral III. Subsequent scripts, including the one for the official February 25 anniversary date, incremented the series number each day.3 That means the first broadcast would have taken place on Sunday, February 1, just as Walter had been arguing all along. The Voice of the America first went on the air on February 1, 1942, not February 25, as previously reported. We sincerely regret the error. WINTER:   This is a voice from America. KAPPEL:   This is a voice from America at war. KAPPEL:   Today, America has been at war for fifty-eight days. America to talk about the war. Here in America, we get news from all over the world. I think “this is a voice from America” probably captures the intent better than the more literal “here speaks a voice from America,” which sounds to me like the English dialog for an actor who is trying to portray a German in a 1950s Hollywood movie.